Most of us have heard these and many other parental adages over the years – but how many of us really stop and think about the importance of such advice when it comes to being prepared? I may drive my family nuts when I ask if everyone has a sweater or sweatshirt before we go out the door, but every time the weather changes on us, they are glad they had something to throw over their shoulders. My teen heaves a big sigh every time I make her change out of flip-flops before a road trip (or bring socks and shoes), but if we break down and have to walk somewhere, she’ll be thankful for mean old mom’s demands. As someone who has lived around the world and dealt with both personal emergencies and weather-related incidences, I can attest that there are certain habits that, once ingrained, will serve you well some day. These habits may seem silly, neurotic, or just too simple to even think about, but they’ve helped me react more quickly (or better yet, be proactive), have alleviated my worries and concerns, and have even allowed me to help others in stressful and scary situations. The best part about the following list of habits is that the bulk of them are about making the most of what you have and using your brain. 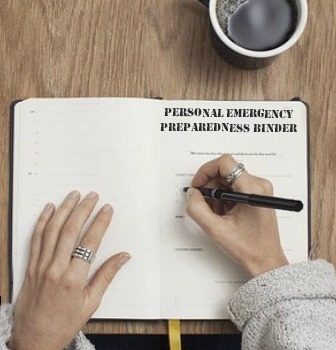 If you’re just starting out on your journey toward preparedness, you can choose just one or two basic concepts to incorporate into your daily routines, making you more prepared almost immediately. If you’re further along, pick something that you could brush up on or use this list to ask yourself how you’re really doing. Every one of us is unique, as are our homes, families, and lifestyles, so these lists aren’t meant to be exhaustive or a perfect fit for everyone. Please use my experiences and insights as a springboard to think about habits you can develop (or habits you might want to break), and go from there! 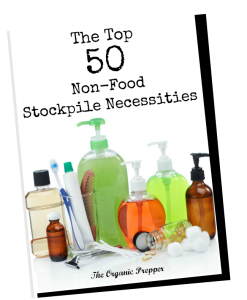 Create a drop point for your keys, wallet/purse/briefcase, and other items vital to your day. We have a key rack that is hung near our most used door, which my keys always go on as I walk in the door, and my purse is always nearby. In an emergency, everyone in the family knows where these items are and anyone can grab them on their way out the door – even in the dark. Bonus: no more lost car keys! Change batteries in smoke detectors and carbon monoxide alarms when you change your clocks; then change passwords for online accounts, save a backup of your computer files, inventory your pantry, rotate your vehicle emergency items, and perform other tasks that may need to be done seasonally. Having a set day twice a year will ensure you’ve got these things on the calendar. This is a great time for dental exams and cleanings as well – you’ll always know when you’re due for a checkup! Speaking of exams, try scheduling your annual physical based off of your birthday or anniversary. If you’re a fairly healthy person, it’s easy to let an annual exam go, but being in good health is key to being prepared for what life throws your way. Scheduling exams near your birthday will get you in and out of the doctor’s office at a time that’s easy to remember. Teach children to enter and exit vehicles quickly and to buckle up as promptly as possible. With wee ones this can be difficult, so another option is for all children to enter through one door, while you monitor their entry and the parking lot around you. If your vehicle has a key fob, consider locking the doors behind your passengers while you walk around to the driver’s side and unlock only your door. Keep car doors and windows secured as much as possible, especially when driving in densely populated areas. Every predator likes easy prey – a carjacker can’t open your door easily if it’s locked and burglars love open garage doors and windows. Hitting the road? Wear or pack sturdy shoes, and even for quick errands, channel my grandmother and make sure you take a sweater or jacket! Keep all vehicles fueled with at least half a tank and maintain them properly. You can deck out your rig with every survival tool on the planet, but you’ll still need fuel if you want to drive off into the sunset! Drive carefully and with awareness. Speed demons have to spend more on fuel, on maintenance, and on tickets and insurance. Do some research on defensive driving and “hypermiling”; you needn’t drive like a slug to reap the benefits of not tailgating and having more room to maneuver in bad weather or heavy traffic. Let the other guy be the one who gets pulled over. Learn to use mirrors and reflective surfaces to better your awareness. Obviously this is essential out on the road – your mirrors and head checks will help you see tots on bicycles crossing behind you and semi-trucks barreling down on you. Being in the habit of using shop windows to check out fellow shoppers is also a great habit; if you’re ever in doubt about being followed or someone’s intent, you can stop and “window shop” and get glimpses without turning around. Learn and live Colonel Jeff Cooper’s combat mindset and color code. You can even practice “Condition Orange” in the aforementioned traffic situations: watch what other drivers do, make a prediction about their behavior, and preplan the action you will take if they do act in a certain manner. This saved me thousands of dollars in repairs and a freeway speed accident years ago! While merging onto the freeway I noticed a flat bed truck with a wooden frame and sheet of glass on the back. Thinking about how I should react if something like that were to fall off such a truck, I slowed and gave the driver more room. You can imagine the size of my eyes when he sped up and the entire frame began to rock and tilt right off the flatbed! Because I slowed down, I had more room to maneuver; because I had thought, If that were to fall, I could cause an accident by slamming on my brakes. I won’t do that. I will steer to the opposite shoulder and go around it. That’s exactly what I did, and I went right past the debris and the truck as the truck driver hit the brakes and pulled over! The same sort of practice can be done in a shopping mall, the library, your office, and in your own home. The more you practice “If s/he …, then I …” scenarios, the more prepared your mind will be in a crisis. Learn to trust your gut! I certainly don’t think some superhero prepper power came out in my freeway experience. A gut instinct simply gave me a few seconds notice and piqued my curiosity about how I could best respond, allowing me to pre-plan and react as smoothly as I did. If you’re not in the habit of trusting those feelings, consider examining them more closely and listening to what they are telling you. People watch. Some of us already have this nosey little habit, right? There are folks out there who are delighted to wait for friends and family in an airport, on a park bench, or in a café because people are just so fascinating! People watching is a great way to start testing your combat mindset, as well as to be aware of how things normally go in your neighborhood, your church, and your workplace. If you recognize the vehicles that frequent your block or the people who sit in the pews around you, you are better prepared to both welcome friendly newcomers and to stave off those with ill intent. Be professional and confident in your dealings with others. As the old saying goes, you’ll get more flies with honey than vinegar, so remember that you’ll be more likely to get what you want or need if you communicate in a calm, professional manner. Confidence also makes you less viable as prey to those with criminal intent; being calm is vital to deescalating a situation when faced with someone dealing with mental illness. Research effective communication and how to diffuse situations when dealing with difficult personality types – it will make a difference in family and public communication, but it could also save your life. Lastly, choose to be positive! A good attitude and a survivor mentality can make or break how you survive crisis situations both large and small. Being a “Negative Nellie” is bad for your morale and that of everyone around you. Learn to look at the glass (or the gas tank) as half full and you’ll see opportunities in a survival situation that others might not. You needn’t don rose-colored glasses and be a Pollyanna, but since about forty percent of our happiness is achieved through choice, it is possible to reap health and social benefits from a habit of viewing things positively. Do you practice these simple habits? Are there other habits you’d like to add to the list? Let us know in the comments section below. About the Author: Melonie Kennedy is a military wife and homeschooling mother who sometimes forgets her own sweater while asking everyone else about theirs. You can visit her online at www.MelonieK.com.